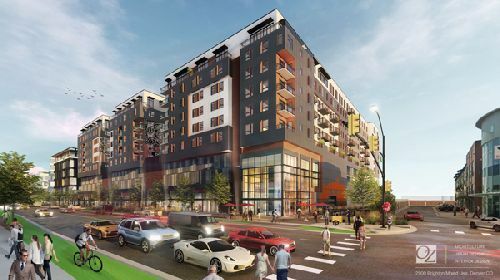 Mass Equities and AECOM Capital Inc have announced plans for a mixed-use development on a 7.8-acre site along Brighton Blvd in Denver’s River North Art District (RiNo). The project, called VARIO, entails transforming an existing industrial property into an innovative, mixed-use environment. Once complete, VARIO will be the largest project of its kind in the region. VARIO embodies RiNo’s dynamic past, which was first populated by pioneering artists who lived in the then-neglected lofts of the neighborhood. Together, they founded an Art District that is original, inspiring, artistic and gritty, and has become much more. The initial plan for VARIO envisions 459 apartment units, an additional 92k sf of creative office space, and 30k sf of retail space, in addition to parking. In addition to the new build, the initial phase of the project is the re-imaging and expansion of the existing 62k sf building at 3060 Brighton Blvd into a state-of-the-art creative office building, taking advantage of the soaring and dramatic ceiling heights. Mass Equities is a private equity real estate investment firm based in Santa Monica. AECOM Capital is the investment arm of AECOM.